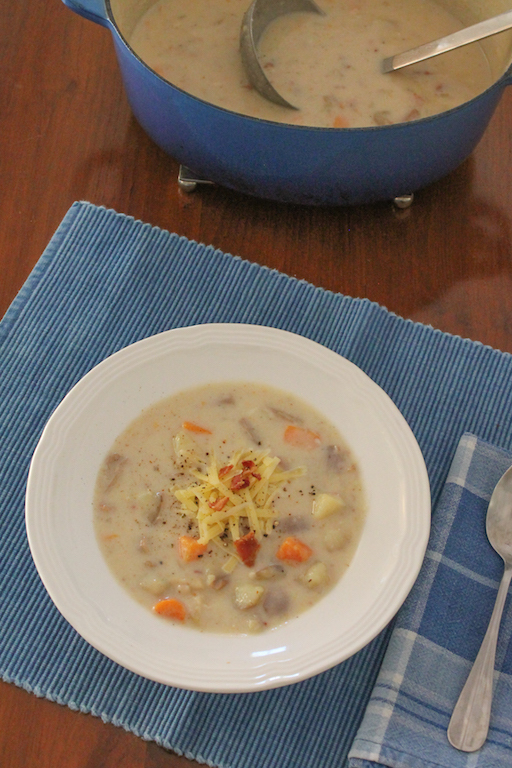 This creamy thick potato soup, seasoned with shallot, garlic and bacon, is sure to warm body and soul on a cold winter’s day. 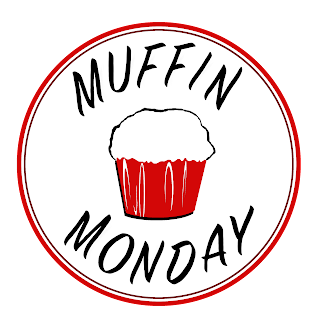 One of my favorite days of the month is here – it’s Blogger C.L.U.E. 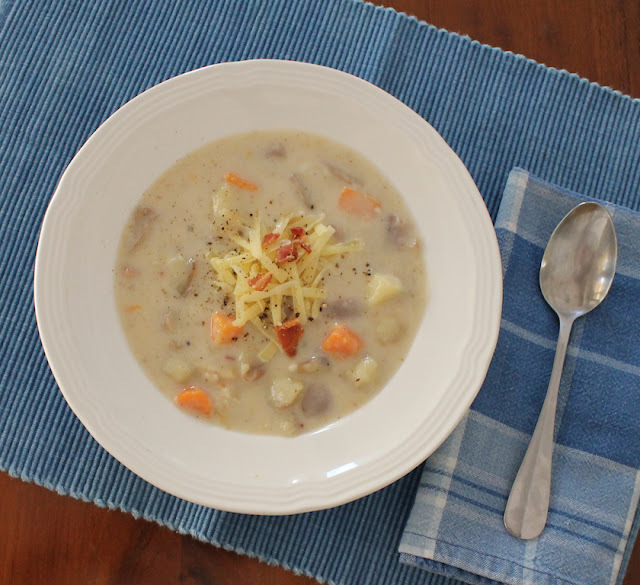 Society reveal day when I get to tell you the clue we were assigned this month – soups and stews - and which blog I’ve been poking around in – the wonderful Eliot’s Eats! 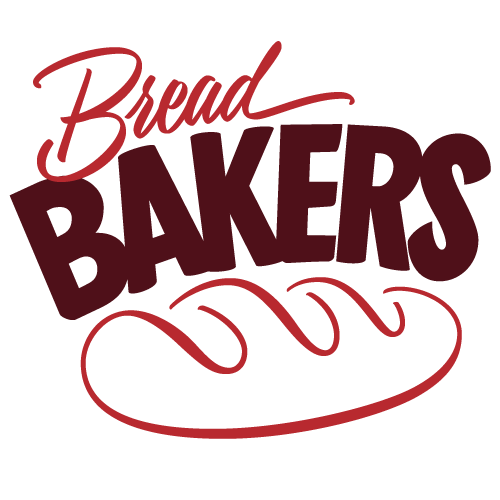 I’ve been getting Debra’s recipe posts in my inbox for a very long time, although I am terrible about commenting, so she may not even know that. I just checked the “read” emails in my inbox and this is the weirdest thing but the very first one was from the day I signed up - a message to confirm my subscription – on February 10, 2013! Isn’t that a wild coincidence! It’s our anniversary! 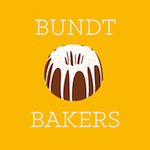 Three years of delicious recipes from Eliot's Eats in my inbox! Proof! Not that you didn't believe me but only because I hardly believe it myself! February 10th! I have to tell you that I didn’t even get around to a search for stews because I was bookmarking so many soups to make that I knew the choice was going to be hard enough. Check out the Cheesy Chicken Tortilla Soup that may have won Debra’s husband’s heart or this spicy Furious Five-Spice Noodle Soup with an Asian flair. I was also loving the way Debra has turned favorite non-soup dishes into soup like these pizza and enchiladas ones. I mean, sometimes you want pizza or enchiladas but sometimes a body just needs soup. Can I get an amen? Those of you in the cold areas of the world right now are going to laugh in my face when I tell you that Dubai is cold when we are only talking the late 40s°F (<10°C) at night but remember that we have no heating whatsoever. These tile floors, thick walls and reflective windows are designed to keep us cool during the extraordinary heat of summer but they make it really chilly indoors during the wintertime. Plus I don't seem to own the right clothes. 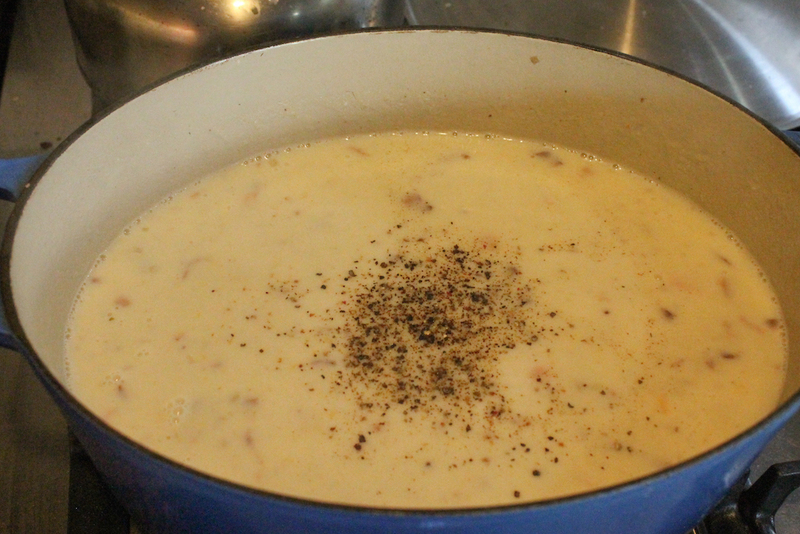 What I needed was a thick, comforting soup so I finally settled on Debra’s mom’s Okie Peasant Potato Soup because it starts with bacon and ends with cheese, and what could be more perfect than that? Ingredients - Makes about 6 servings. Cook your bacon until crispy and drain on some paper towels. Reserve 3 tablespoons of the bacon fat. 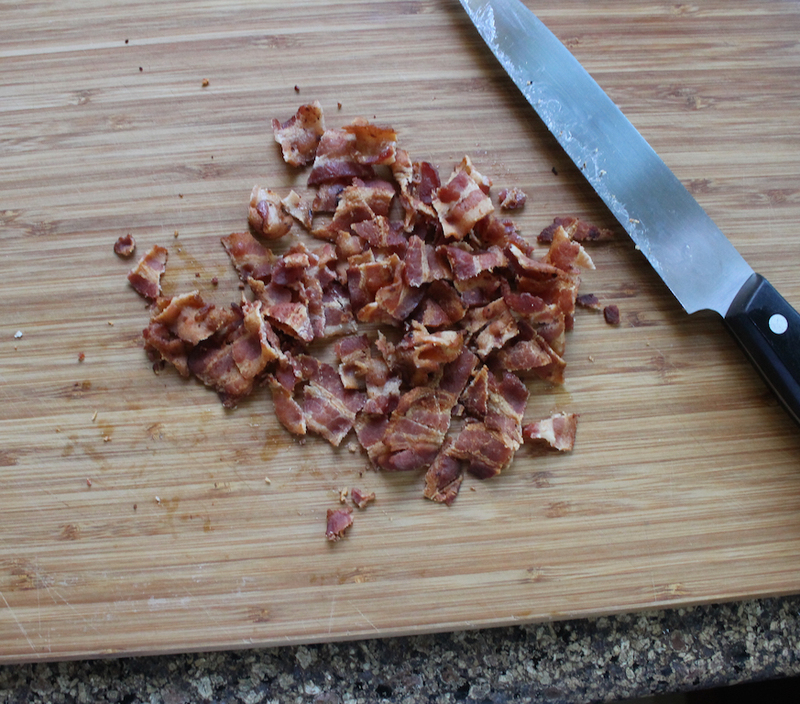 Chop the bacon with a sharp knife and set aside. I also set aside just a little for use as garnish when serving. I left it pretty chunky. 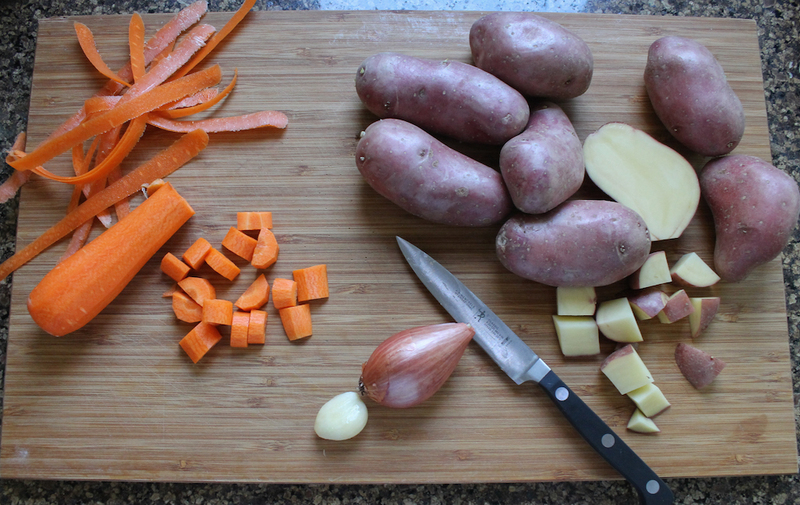 Cube your potatoes, leaving the peels on. 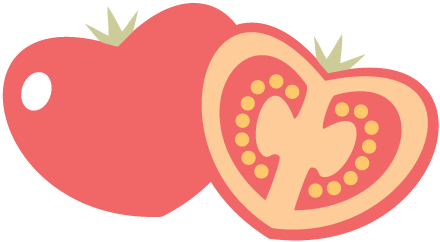 Peel and dice your carrot. Peel and mince your shallot and garlic clove. Put one tablespoon of bacon fat in a large pot with the minced shallot and sauté until translucent. 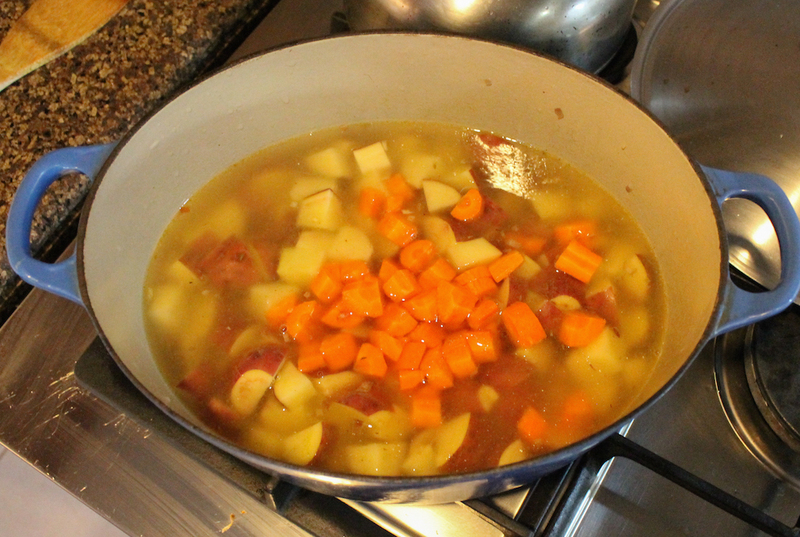 Add in the potatoes, carrots and chicken broth and bring to a boil. Cook until carrots and potatoes are tender, about 10 minutes. In another saucepan, heat the rest of the bacon fat and lightly sauté your garlic. You don’t want it to brown and turn bitter, but just to soften. 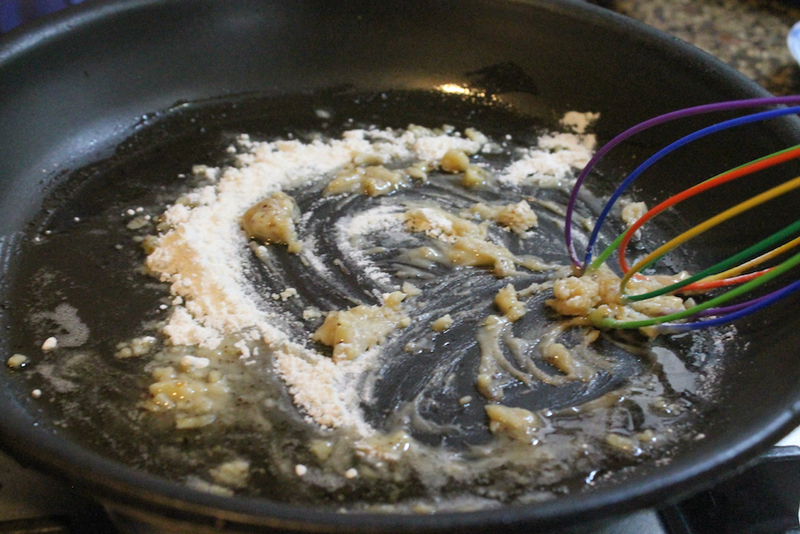 Add the flour and whisk until mixture bubbles to cook the flour. 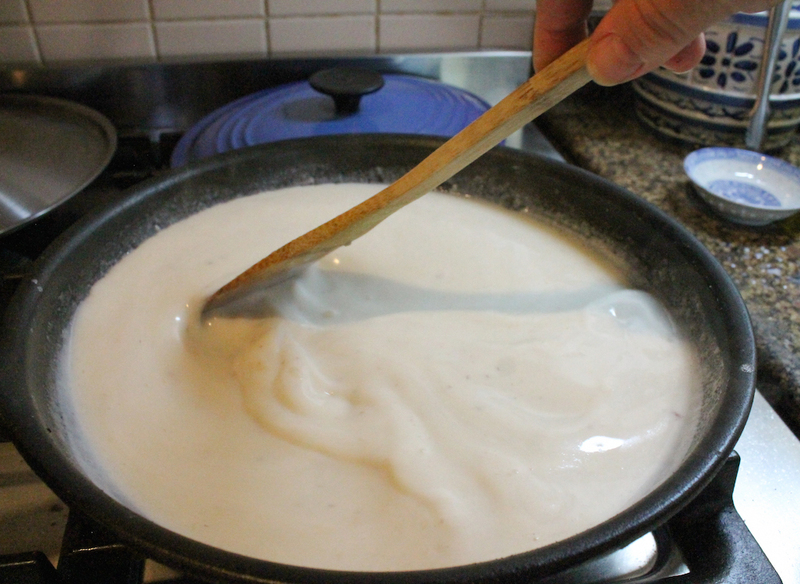 Carefully whisk in milk to make a sauce. 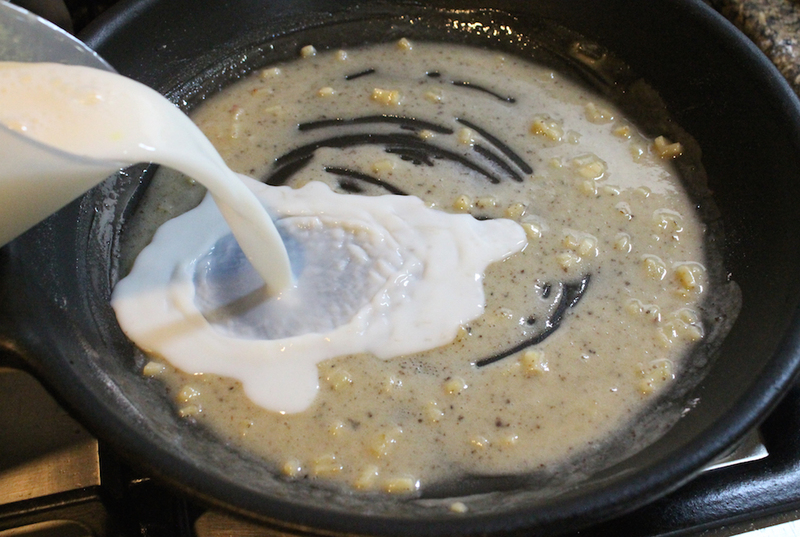 Cook for a few more minutes until the white sauce thickens a little and then remove from the heat. Use a firm whisk to add the sauce into the potato pot. 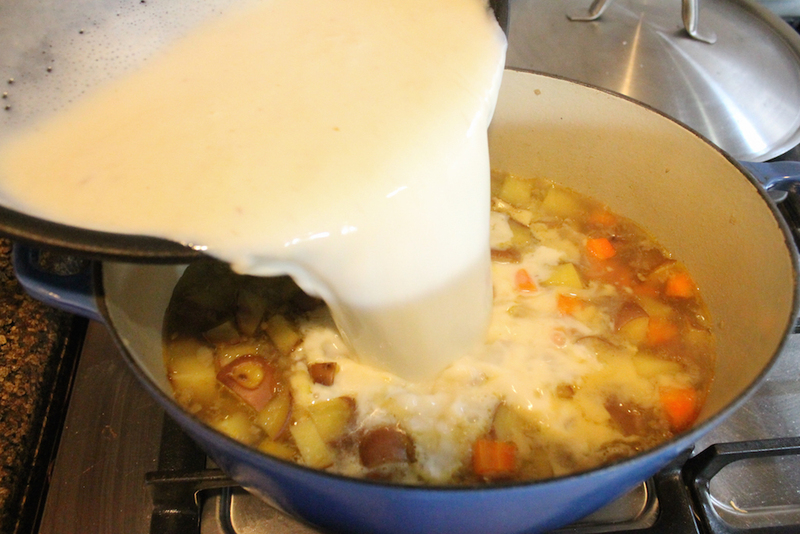 Some of the potatoes should break up a bit, thickening the soup even more but make sure to leave some chunks too. Add in the crispy bacon bits. 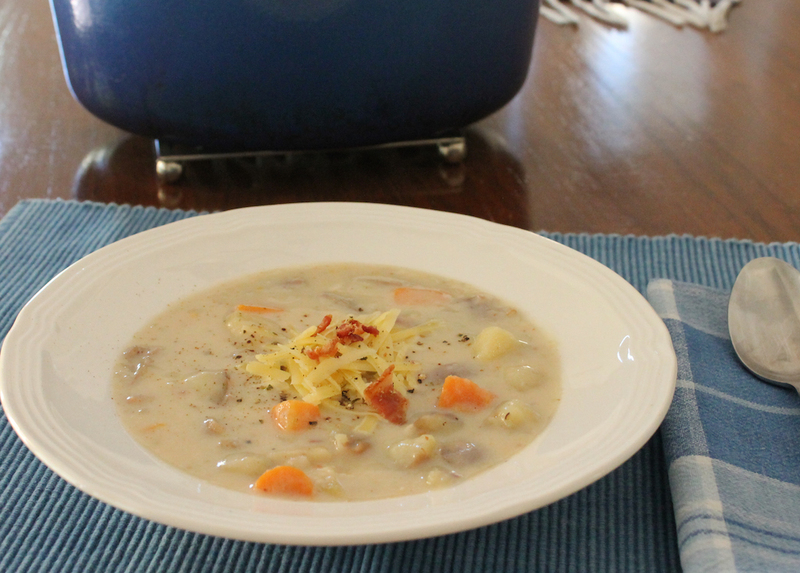 Cook for a few more minutes and then taste your soup. Add salt if it needs any and few generous grinds of fresh black pepper. Ladle into warm bowls. Sprinkle on some cheddar cheese (and bacon if you saved some) to serve. And, yes, that's just a little more black pepper. I love that stuff.